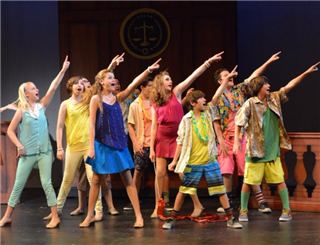 The verdict is in on this year's Middle School production of Legally Blonde Jr. - it was a hit! On May 21st - 23rd, a young, talented cast and crew delivered the upbeat, heartfelt tale of Elle Woods, a fashion-loving sorority girl who goes to Harvard Law in search of love and ends up finding herself. The infectious energy of the production came through in colorful costuming and lively choreography, and catchy songs like "So Much Better" and "Omigod You Guys" had audience members humming all the way home. Snaps to the performers and crew for pulling off the show's trademark humor while still bringing warmth and depth to a vibrant cast of characters. Thanks also to Ms. Irvine and Mr. Dziekonski for directing and producing another outstanding show.